Baringo Governor Benjamin Cheboi heckled and called "County Thief". - Bana Kenya News, Real African Network Tubanane. 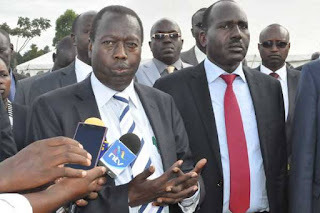 Home News Baringo Governor Benjamin Cheboi heckled and called "County Thief". Baringo Governor Benjamin Cheboi heckled and called "County Thief". Baringo Governor Benjamin Cheboi engaged with his opponents in a fist-fight regarding the Jubilee nominations in Baringo. The opponents supporters called the governor a county chief thief. Cheboi got angry and decided to confront them fearlessly. The governor Benjamin Cheboi was heckled by Irate voters at Eldama Ravin town hall. The Baringo nominations have had a lot of hiccups following underestimated ballot papers. The voter turnout was tremendous regarding the nominations as it is the second time to have elections under the new constitutions. The governor said that the nominations will not continue unless the Jubilee official rectifies or fix problems. The problematic and chaotic nominations in jubilee are extremely chaotic than what happened in ODM. The County did not have enough ballot papers, no enough time for voting and others were already marked. The Jubilee supporters claimed that the Top officials in the party have already denoted some people to lead them which it is undemocratic. The Jubilee secretariat has also been alleged of sabotaging the process internally by their supporters. The Secretary General said that all the issues will be fixed today. The owners of the party(Jubilee) allegedly to have their own favourite candidates which the supporters do not want them.